React internal class for render custom component and DOM component to native platform. React internal class for render DOM component to native platform in the end. class for virtual DOM node (element), element’s type field will be the paramter passed to React.createElement. instance of UserDefinedComponentClass or DOMAutoGenerateWrapperClass, it links to React internal class instance by _reactInternalInstance field. 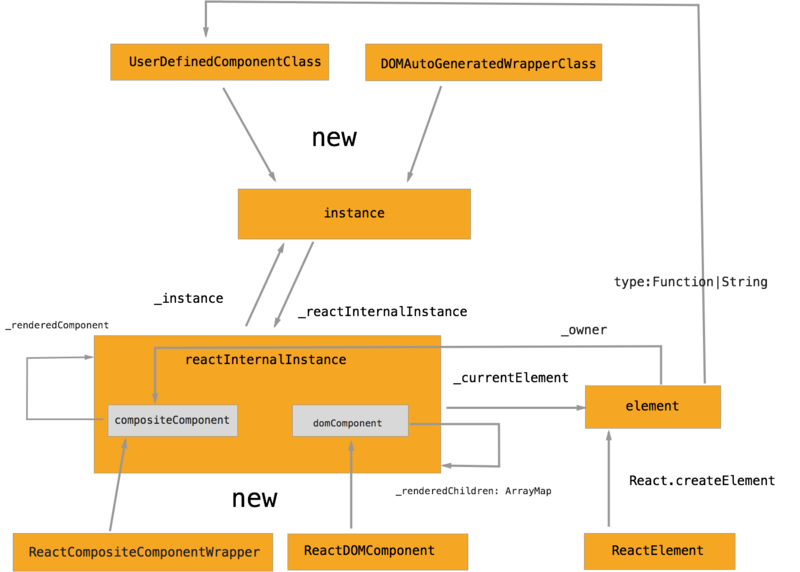 there are two types of React internal class instance: compositeComponent and domComponent. element will link to it by _owner field. owner is the component which element is created from its render() method. It also link to component class instance by _instance field, instance and reactInternalInstance are 1-1. It links to React internal class instance transformed from its render() method’s return value by _renderComponent field, so render method can not return array. In the end, it all goes to domComponent, dom component will render its children recursively(_renderedChildren), each of its children is a React internal class instance.